The American Flag: Glorious! Majestic! "When speaking of America, I cannot help but feel patriotic!" As we are approaching Flag Day and July 4th, Independence Day, I feel called to share this "vision" on the American flag, I named it " I have Seen The Glory" in reference to my experience on the evening of July 4th 2007, approximately forty days before I became a U.S. citizen. On this great evening, my family and I and a group of friends and relatives gathered among thousands of spectators to watch the Fireworks. We sat in front of the stage in lawn chairs and on blankets stretched out on the lawn. Live bands filled the air with patriotic songs and music, it was a quite awesome feeling, the whole area was vibrating with sound and drum beat. As the evening progressed and the time for the fireworks drew nearer, the orchestra proceeded to play the National Anthem, "The Star Spangled Banner". Near the stage, at attention a line of guards in veteran uniforms, held three different flags, a red, white and blue flag, blue flag and a black flag. They marched to the front of the stage as the national anthem played. I was deeply overcome by this patriotic scene as if the three men with their flags had just come down from heaven! There weren't sufficient words to describe it. The closest I could find were Glory! Majesty! I had an epiphany about these flags that revealed to me an awesome invisible meaning. Although the Vision revealed to me the meaning of each of these three flags, the national flag, known as "The Stars and Stripes", was the most glorious, sacred and lively flag of the three, a flag that represented past, present and future. From this sacred flag a super highway opens up to heaven on the Fourth of July where ancestors descend and ascend for reunion and celebration and to enjoy this proud day with their beloved descendants. This flag is like a gate from which ancestors can enter the earth's sphere and interact with people's feelings and emotions. As all these thoughts (vision) poured through my mind, waves of emotion came over me and I began to tremble with overwhelming patriotism. I stood up, saluted the flag, placed my right hand on my heart and sang with the crowd. As Americans, it is important that we respect and treat the U.S. flag as sacred and honored symbol of our nation. According to Rev. Moon's teaching, America is the "New Israel", prepared by God for a very special providential mission. Many skeptics are not so sure whether America is God's special nation, but the Founding Fathers weren't confused about this point. They were absolutely clear that America is founded on God, a special nation, prepared for a divine purpose. Proof of this is written everywhere in the Constitution! Skeptics, need to go back and study American history. While I was preparing for my citizenship interview and taking the test of 100 questions on United States history, I came across an interesting interpretation on the symbols of the flag. In the interpretation, the stars symbolized a "new constellation", red symbolized hardiness and valor, white symbolized purity and innocence, and blue symbolized vigilance, perseverance and justice. 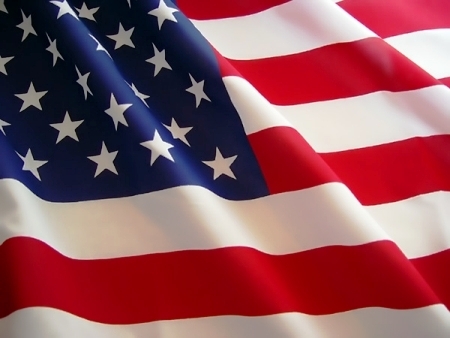 Where on earth can we find a flag, deeply sacred and Godly as the United States flag?